This past weekend a fire damaged the warehouse building two doors away, heightening the visible contrast between rural/suburban ideals and the ugly side of urban life. 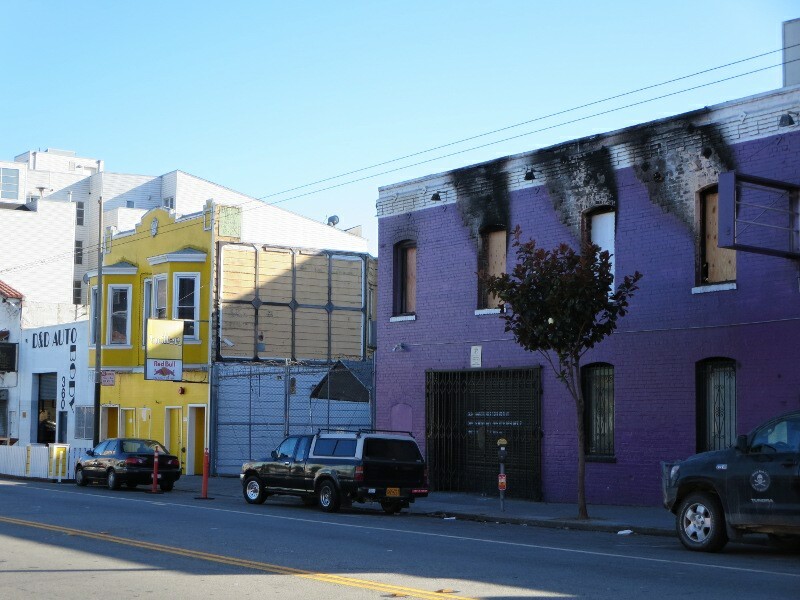 Neighborhood organizer Jim Meko reported tartly on his site that the damaged building has its own history in the 15-year-plus running dispute over the future of 11th Street. That debate has mainly concerned whether the street shall remain exclusively for entertainment and business uses or whether residential development can coexist with either. As Jim notes, given current economic pressures the fire is likely to hasten the upward economic climb of 11th Street no matter how the damaged property is rebuilt. Tech is already very much on that block. Heroku, for example, has offices in the big brick Jackson Brewery building on the corner. Suburban residential expectations made their first appearance South of Market with the Web 1.0 tech influx and loft boom. Condo conversions changed the neighborhood radically during that time, peaking between 1998 and the Nasdaq plunge of 2000. Noise and other factors perceived as nuisances were the initial wedge issues between older and newer uses South of Market. Fundamentally, these disputes had to do with whether South of Market, then being renamed “SoMa”, was inside or outside the respectable city. It had been presumed for years that South of Market took in the businesses and people rejected from more manicured city neighborhoods: loud or rude entertainment sites; immigrants and others who faced discrimination elsewhere; poverty services; loud or noxious factories; meat packers with their smells; auto body shops with their paint fumes; bus yards and delivery garages; latterly, artists’ and artisans’ studios. Harsh policing driven by social rejection had pushed the gay bathhouses and related gay leather culture to South of Market. After the bathhouses were closed, their places were often taken by other institutions viewed as being difficult neighbors. As this report of a local history tour explains, the former Club Baths at 8th and Howard became the Episcopal Sanctuary shelter and the Sutro Baths became the 1015 Folsom club. That all changed — or rather, began to change — with the late-1990s loft boom. Condo buyers began to arrive from suburban upbringings, bringing with them suburban standards regarding noise and nuisance. Existing business owners and rent-controlled tenants feared new residential uses, not from fear of new housing per se, but from fear of monied, politically able newbies enforcing rights to quiet enjoyment of their premises — rights that, legally speaking, they did often possess. 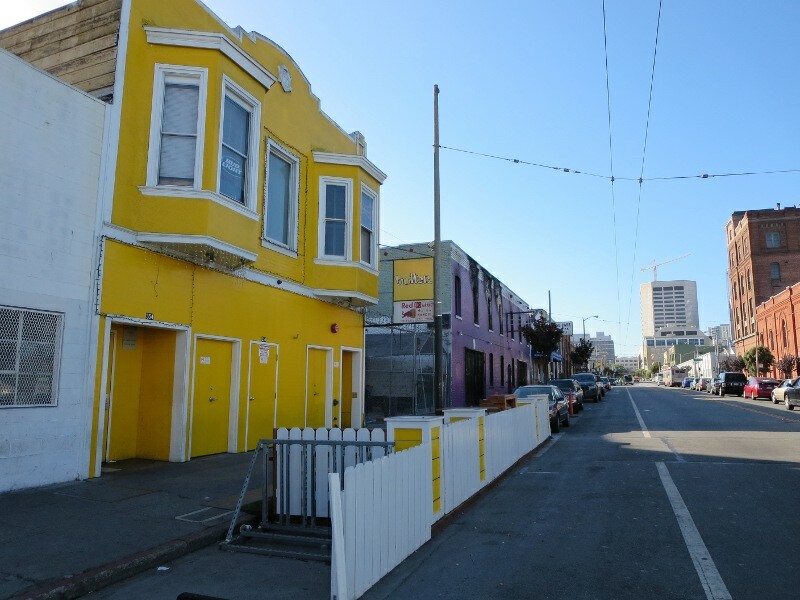 Considering the history of noise South of Market, many past residents would have found it laughable to suggest that clubs harboring loud music and noisy drunks should preclude people from making their homes on the same block. Our own apartment, quiet now, is near a condo-converted warehouse that used to be a furniture factory. The landlord who originally rented to us had lived in our unit when part of its price was tolerance for bandsaw noise amplified by concrete walls. Suburban ideas of neighborly duty have moved into South of Market to stay — at least, compared with late-1990s conditions, I’d say they have. I benefit from them personally. I can work at home undisturbed day or night, except when the yuppies in the converted furniture factory get to partying. But I continue to wonder if these currently applied noise and nuisance standards are any more suited to our dense downtown area than Butter’s comical picket fence. A thing people forget in their nostalgia: that picket fence had Tom Sawyer’s Aunt Polly standing behind it, shouting at him. Tom (or anyway, his author) ran away to San Francisco to escape her. This entry was posted in Housing dysmorphia, San Francisco on September 18, 2013 by Martha Bridegam. Pray, tell all of us renters who have been in west soma since before you were born when the clubs will join the community and really care about their impacts? We were here before there we clubs, even before 1968!! Your view of reality is very much different and your flip attitude and views sync with those of club owner. Money and profit before people! Mark Leno, Terrance Allen, Mark Rennie and all the rest of the “machine” will be brought down one of these days because they don’t care about anyone but themselves. I don’t love the behavior of many clubs’ customers either. I especially don’t love the way detritus left behind by clubbers’ nighttime bad behavior gets blamed on poor people. And I’ve done my share of yelling about 2 a.m. private parties. But noise and other forms of mutual aggravation are facts of downtown living. Were you here before the factories? Check out the old Sanborn Maps! There was always residential in west SOMA, Even before the 1906 fire. As a matter of fact residential was the first and primary land use for the south of market area, not “industrial” or “manufacturing” or any other land use. Absolutely, yes, people have always lived in houses and apartments and hotels South of Market. But hasn’t there always been some interdependence, and some jostling too, among different kinds of uses on the same streets? My point is certainly not that club owners or anyone else should feel entitled to ignore neighbors. It’s that South of Market does best when there’s a successful balance among multiple uses. City streets with multiple uses produce more nuisance factors, but also more convenience and enjoyment, than equivalent suburban streets. Or wouldn’t you say? When clubs join with and work with existing old time neighbors like me, when they at least OFFER to help clean up each and every morning after their clubs operations, when they actively and proactively reach out to turn the noise down and police the neighborhood and teach their clients to respect neighbors then I will concur with your comments. I have zero problems with other land uses, be they community clinics, auto body repair, SROs, even new lofts…provided they respect us and one another. Right now the blunt truth is club owner and those that advocate for them want us, the existing long time residents, to just “put up with it” and if we don’t then they tell us (yes they have told me personally), “if you don’t like it just move to the Walnut Creek. I was born and raised and when to public schools in SF and I don’t plan to move anywhere. Funnily enough I agree about the wrongness of the “move to Walnut Creek” gambit. In the ’90s a developer used that one on our block. The neighbors who found his project alarming were living in existing old wooden apartment houses. He was proposing to turn a factory building into a much bigger loft complex with a high, shadow-throwing concrete wall along the property line and a lot of corrugated steel features that aestheticized and exaggerated the characteristics of industrial properties. Through significant negotiations, whose effects continue to need followup 15 years later, we persuaded the developer to humanize the project’s shape and scale. But, yes, there’s a difference between “not Walnut Creek” and “created in diametric contrast to Walnut Creek”.